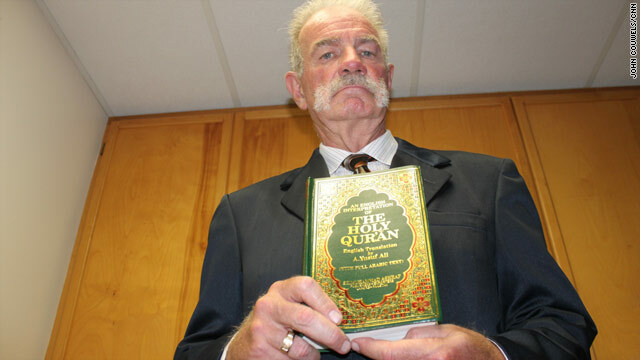 Terry Jones holds one of the Qurans he plans to burn on September 11, 2010 at his church. Islamabad, Pakistan (CNN) -- The U.S. Embassy in Pakistan condemned a Florida church's plan to burn the Quran, the Muslim holy book, as "disrespectful, intolerant and divisive," in a statement on Wednesday. "We are deeply concerned about all deliberate attempts to offend members of any religious or ethnic group," said Stephen Engelken, the second-ranking diplomat at the embassy. The pastor of the church, Terry Jones, said Tuesday his flock was taking the warning seriously but had not decided to cancel the event, planned for September 11. Jones told CNN that while his congregation still plans to burn Qurans to protest the September 11, 2001, terrorist attacks, the church is "weighing" its intentions. Jones, of Dove World Outreach Center in Gainesville, Florida, said the congregation is taking seriously the warning from the U.S. military that the act could cause problems for American troops. "We have firmly made up our mind, but at the same time, we are definitely praying about it," Jones said on CNN's "American Morning." Later Tuesday, Jones questioned Petraeus's statement that the burning of Islam's holy books "could cause significant problems" for American troops overseas. The U.S. Embassy in Kabul, Afghanistan on Tuesday issued a statement saying the U.S. government "in no way condones such acts of disrespect against the religion of Islam, and is deeply concerned about deliberate attempts to offend members of religious or ethnic groups." "Americans from all religious and ethnic backgrounds reject the offensive initiative by this small group in Florida. A great number of American voices are protesting the hurtful statements made by this organization," the Afghanistan embassy said. Indonesia has the world's largest Muslim population. Jones said Muslims are welcomed in the United States, if they observe the Constitution and don't try to impose Sharia, or Muslim law. The message, he said, is directed toward the "radical element of Islam." CNN Islamabad bureau chief Samson Desta contributed to this report.